Penny Arcade Expo East was in Boston on April 6th through 8th, which, at the time of this writing, was last weekend. Here is a random list of things I saw and how I felt about them! It's not the style that's the problem. 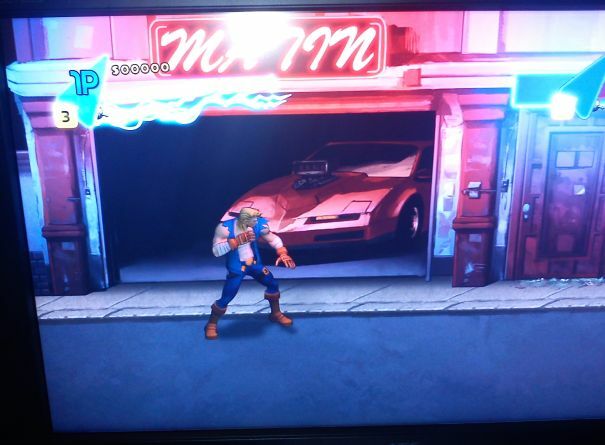 No, Double Dragon Neon is bad because it's just a bad beat-em-up. It's in that weird mid-way point where it doesn't play like Double Dragon but doesn't strive to be anything better either. Any number of 90s arcade-style beat-em-ups, like Streets of Rage 2, Final Fight, or even Double Dragon Advance for the GBA, just play MUCH better. Apparently it's only been in development for a few months, but considering publisher Majesco was touting a Summer 2012 release, it's only giving developer Wayfordward five months at max to get things into get. 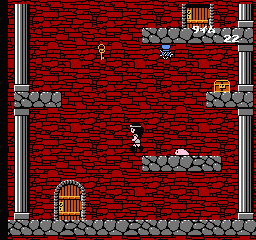 There are thirteen levels in this game, each one based on one of the mainline games in the series. 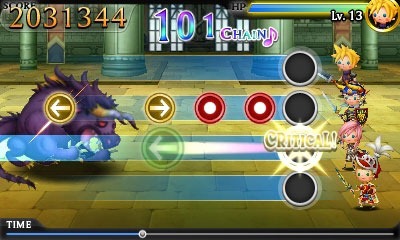 The first is a jaunty "journey" theme, the second is a battle, and the third is an "event" song showing famous footage from the game in question. None of the music is arranged (I played the FFVI level), and I'm a little at odds with the cutesy character redesigns. As a rhythm game, it's not even particular innovative, because you just tap or swipe the screen as necessary, and the RPG elements seem grafted on to either unbalance the game or encourage OCD. But man, I do love the Final Fantasy games. And it's not as aggressively awful as those Final Fantasy VII spinoffs were. It's just so obviously engineered to appeal directly to the weakness of people like me, and I feel like a sap. Bububu Terra's Theme! I'm a awful person. While I was watching someone play Swords and Sworcery at the Capybara booth, I ended up chatting with someone who ended up being Craig Adams, AKA Superbrothers, who did the distinctive pixel artwork for the game. I really wish I'd made this a formal interview and actually recorded it, because it was a cool conversation about the nature of puzzles and their place in adventure games. When I discussed my book, he mentioned how he loved adventure games growing up due to the artwork and writing, but going back and playing them, just hated the puzzles and found them all insufferable. Swords and Sworcery was largely created as a response to that, to give the player the best of the genre without sticking in the worst. Of course, that becomes an issue because then it's not much of a "game", and therefore the interaction begins to feel inconsequential. I think it works for Sword and Sworcery, but only because it's aesthetically so excellent - without that style, it would be almost completely insignificant. Because of this I wasn't quite sure whether to stick the game in the adventure game book (also, the iPod port came out around the same time I was finalizing the text, so coverage would've been rushed.) I've been messing around with Adventure Game Studio for the past few months, creating my own game, and while the writing is generally easy, the puzzle design is definitely the hardest part. How can you make the player interact with the world in a way that not only makes them feel involved but also makes sense in, and ideally adds to, the game world? I follow the notion that puzzles should be jokes, the kind that can only be told in an interactive form. (My favorite example is the one in Day of the Tentacle, where you need to get thousands of quarters in order to stick a sweater in a drier in order to shrink it over the course of 200 years, so you can put it on a hamster that you froze. It's only really funny because of the numerous leaps in quasi-logic you need to take in order to reach this conclusion.) But how do you tell those gags without intimidating the player and causing them to get stuck? I keep trying to get my fiancé to play The Secret of Monkey Island, which she gets put off by, but she absolutely loves Psychonauts and Costume Quest. But those are whole different genres - is the only solution for adventure games to succeed to basically not be adventure games, to take the best of them while grafting them onto completely different mechanics? Or just leave out those mechanics altogether, to the point where you're just in a vaguely interactive storybook? Anyway, it was a neat discussion that you'll have to take my word for. On Saturday morning in the retro gaming room Gideon Zhi of Aeon Genesis showed off a few new fan translations he'd been working on. Super Robot Wars Alpha and Super Robot Wars Alpha Gaiden were shown, a huge series that I know has a huge fanbase, though I'm not particularly into them myself. A bit more up my alley was the unveiling of Shin Megami Tensei If..., the third and last Megaten game released on the Super Famicom, which has yet to see release to English. It's still a work in progress, but should be ready in the coming months. Also shown off (though not by Aeon Genesis) was the English translation for Suikogaiden. I would've loved to play this back when Suikoden II came out, since it featured Sierra the vampire, one of my favorite (and apparently one of the most popular) characters in that game, so I'm certainly looking forward to giving it a shot now. There's no official group name for this yet beyond "Suikogaiden Translation Project", but check out the forums for more news. Right before my panel, I ran into someone that I'd talked over e-mail with like a decade prior, in my previous life running The Castlevania Dungeon. 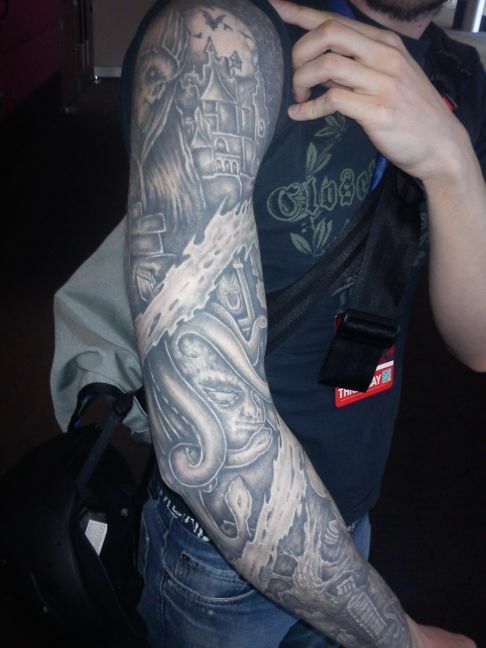 He shows me his arm-length tattoo, which was largely based on Castlevania II: Simon's Quest. You can probably only make out minor details on this cellphone pics, but it was damned cool - there was even a graveyard duck in there. The best part of the arcade room isn't getting to replay old games in their proper context - no, it's actually about discovering these old games that I've never heard of. I was too young to proper visit arcades for most of the 80s, so most of the games I was familiar with were because of their console or computer ports. My favorite? Using a vector display and a trackball, the goal is to draw circles around the various things on the screen. The trail you leave is pretty small, plus those various things can also kill you. It's one of those games that absolutely needs the trackball to function, and is probably why it has (as far as I know) has never been ported. It seems like something that would probably exist as a mobile game though, since it might function as a touch screen game. Published by Stern, this is a dual joystick game that's a bit different from Robotron. 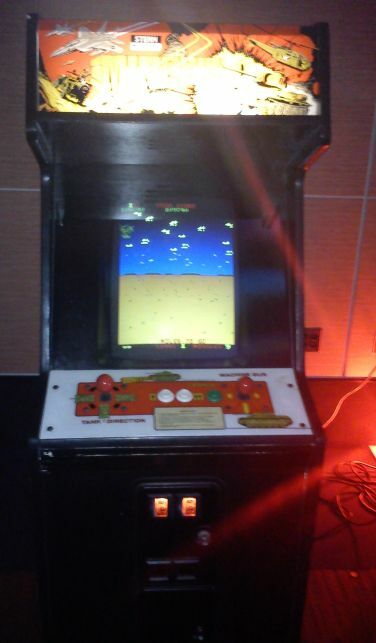 Here, you control a tank at the bottom of the screen, weaving through mines and shooting at enemy airplanes, tanks and other stuff. It's not nearly as harrowing as Robotron, but it's pretty fun, and the challenges in each level are varied enough that it keeps you on your toes. 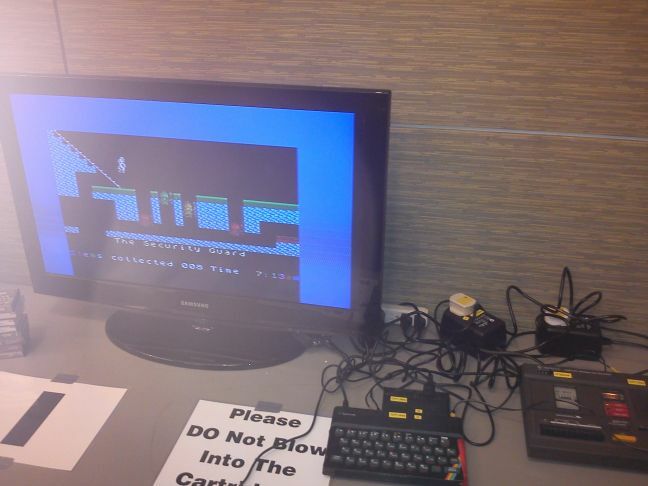 Someone did beat it, so the next challenge was to get to level 5 on the hardest difficulty in Robotron 2084 for the Atari 800. I made it to level 4 - it's the version of the game I grew up with. I don't think anyone beat this particular challenge. The biggest issue with the retro game room, in both this year and previous years, is that they all use widescreen LCDs instead of proper 4:3 CRTs. The reason for this is that, most likely, the company they're leasing all of this equipment doesn't offer older TVs anymore (plus they're ridiculous bulky in comparison, making them more expensive to move) but it's still unfortunate, especially in the cases of these European computers, where the displays were horribly messed up even with PAL converters. 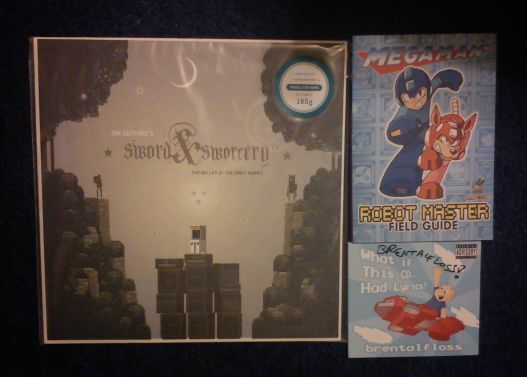 PAX isn't the best place for buying stuff. 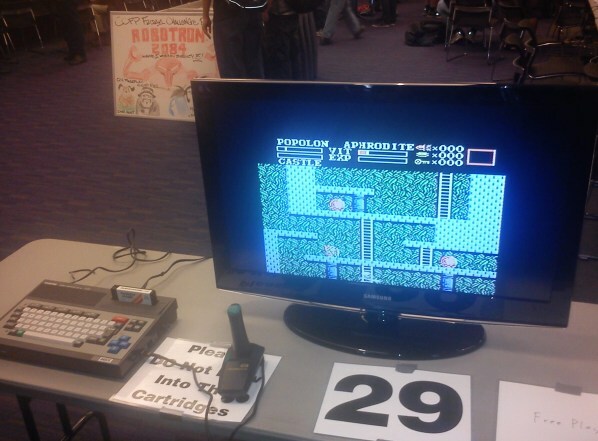 I was discussing this with one of the sellers at MAGFest, and he said that PAX just doesn't draw the kind of audience for retro gaming stuff. There were four booths with retro games, including the infamously super-overpriced Video Games New York, along with some other place that was trying to sell cart-only copies of Chrono Trigger for $90. (I would've taken some pictures, but it's awkward to explain to the owners that you're photographing them with the intention of mocking their absurd prices elsewhere on the internet.) The two other ones, located off to the other sides, were surprisingly reasonable though. On the drive up to Boston, one of my friends introduced to Brental Floss, who is basically the Weird Al of video game music, taking famous songs and sticking silly lyrics in them. It all works! There was a small live show, and the $10 CD seemed like a paltry amount to pay for the guy who brought us "Crazy Duck in Space" (not the actual name of the song, but that's what it basically is). You can grab the MP3s at Amazon too, if you're curious. 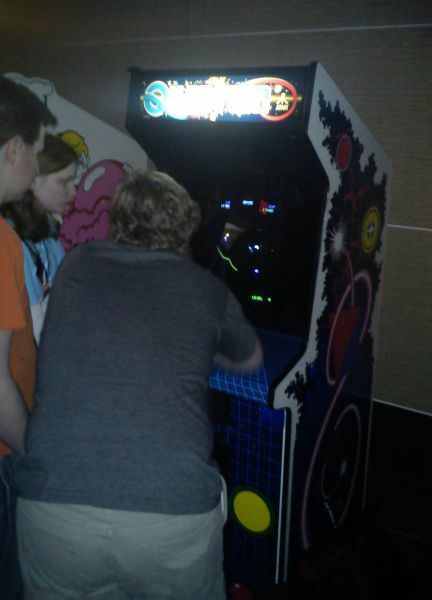 Not actually shown at the convention in any way, shape, or form, but my friends and I watched the Game Center CX episode where Arino tries to conquer this Namco "hidden masterpiece", so all three of my troupe ended up loading it on our phones to try to beat it the whole weekend. It's one of those games with very specific quirks you need to accept (and even exploit), but if you have the patience for it, it's not all that bad. 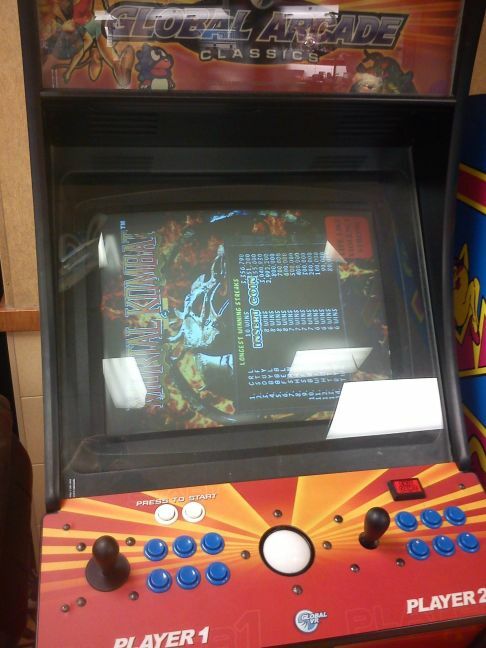 Again, not actually at the convention, but this shifty multi-game cabinet at a rest stop just outside of Boston request that you play their games...sideways! 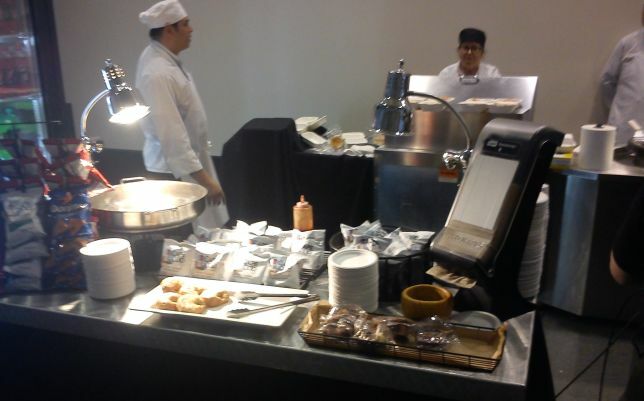 From a wholly rational standpoint, I am never in any mood for $9 convention cheeseburgers, but the ever-present smell of bacon in the area around the expo center entrance made it very difficult to say no. This particular panel turned out pretty well! It was largely driven by audience participation, which makes things more casual than usual. Turnout was a bit small, but that happens when being the last panel on Sunday after most people have left, and everyone else being over at the Gearbox panel. Sorry guys who liked Banjo-Tooie and Syphon Filter 2! It's not that we hate them or anything, we just haven't played them! The audio is available at 1UP. Minefield was amazing! 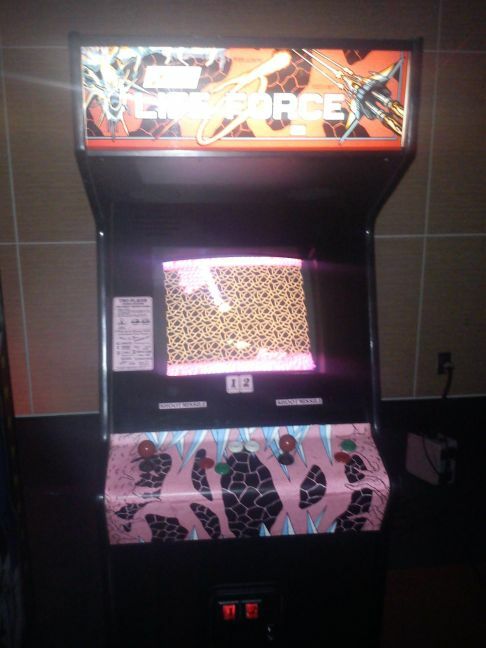 I ended up holding the high score for it Saturday night. I need to play more Stern games. Every single one I play is difficult, surprisingly deep, and amazing. I really wish more of those games got ported. Hrm. 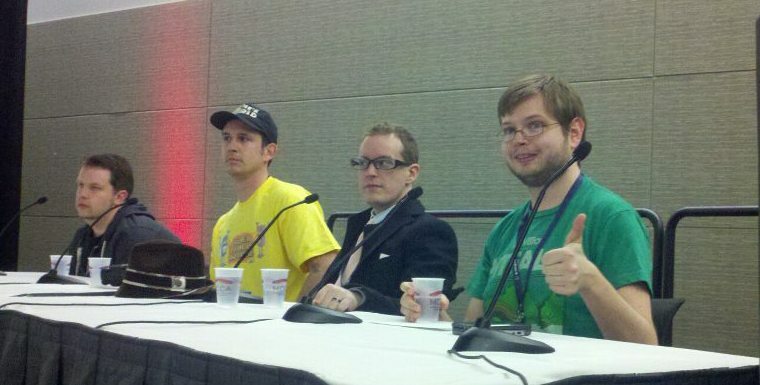 Are you the one giving a thumbs up in the Retronauts pic, DiscoAlucard? I'm sorry I missed that panel, by the way. Fun with trains on Sunday, after all. Hang on a sec: Did Gideon Zhi and I have lunch with you on Saturday, DiscoAlucard? Yup, the dude giving the thumbs up is me, and yup, I remember you from lunch. How goes? Pretty good. I regularly read HG101 (and while I didn't know that Castlevania Dungeon was your old stomping grounds, am a fan of that site too) ...I'm really embarrassed that I didn't realize who you were. I never got to play Double Dragon as a kid (barring the Battletoads/Double Dragon crossover), but I still have high hopes for this new game. How bad could it possibly be? Er, never mind. I probably don't want to know. Kurt- Glad you liked the tattoo, I figured you'd probably get a kick out of that. You're the only person who I haven't had to explain everything on it to! no one beat robotron 2084 on my 800.. mostly because it was to do it with only one controller..
"While it was unveiled last week, this game got a lot of flak for its polygonal characters and generally goofy 80s aesthetics." The aesthetics are part of the problem. It looks like the developers spent more time on making the game look like an "ironic" tribute to the 80s in order to cash-in on the current popularity of Castle Crashers than actually producing a solid game system and fighting mechanics (which they barely talk about in interviews). If it was just some wacky beat-'em-up with a made-up IP that parodied 80's culture, nobody would really care that much and the game would be judged entirely by its own merits. But it's obvious that they're using the Double Dragon name to milk off the nostalgic value that comes with it and that series already has enough bad spin-offs as it is. "Any number of 90s arcade beat-em-ups, like Streets of Rage 2, Final Fight, or even Double Dragon Adventure for the GBA, just play MUCH better." It's "Double Dragon Advance". Also, only one of those games listed was an arcade game, but I still get what you mean. Quantum can be played with a mouse in MAME, which makes it rather easier than in the arcade (at least for me, I don't get on well with trackballs, unfortunately). Still fun though.